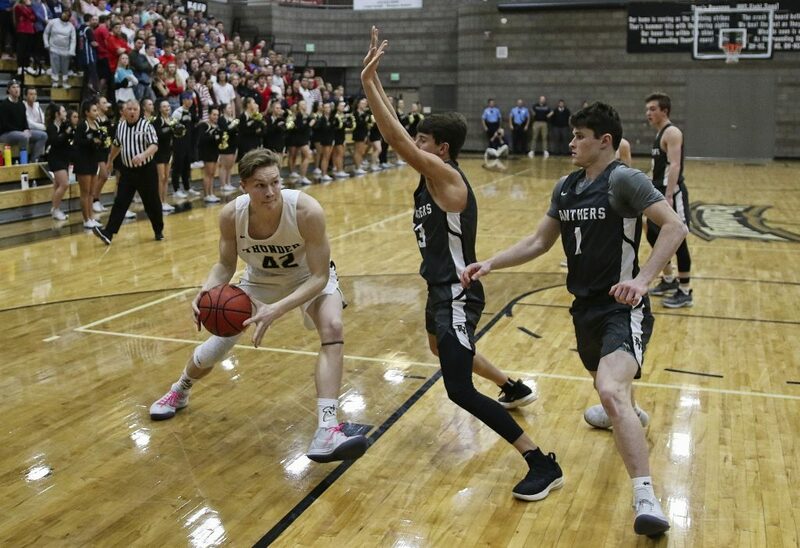 ST. GEORGE — Pine View remained undefeated in Region 9 play Wednesday while the Dixie Flyers eked out a close win to stay within a game of the Panthers. Both teams have started to put some distance between themselves and the rest of the region. 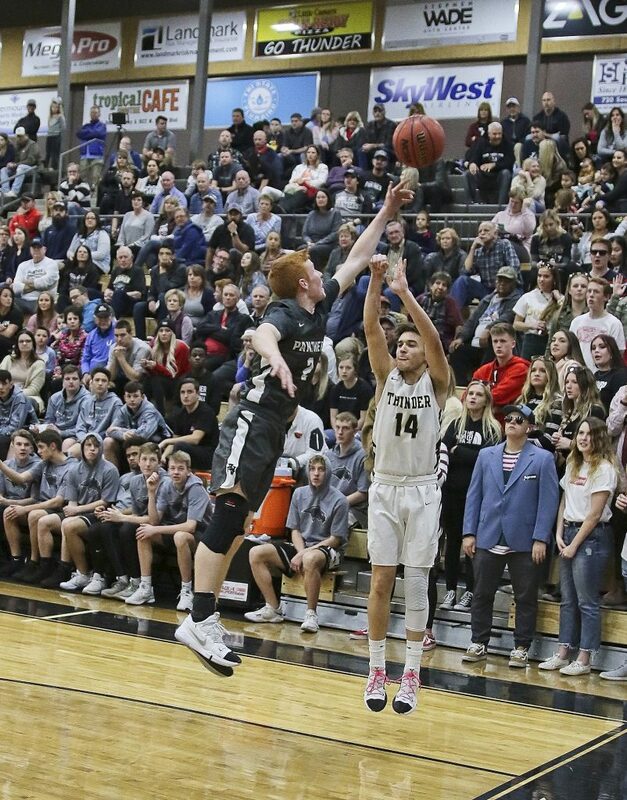 Hurricane won to pull into a three-way tie for third place with Desert Hills and Canyon View, two games behind Dixie and three behind Pine View. 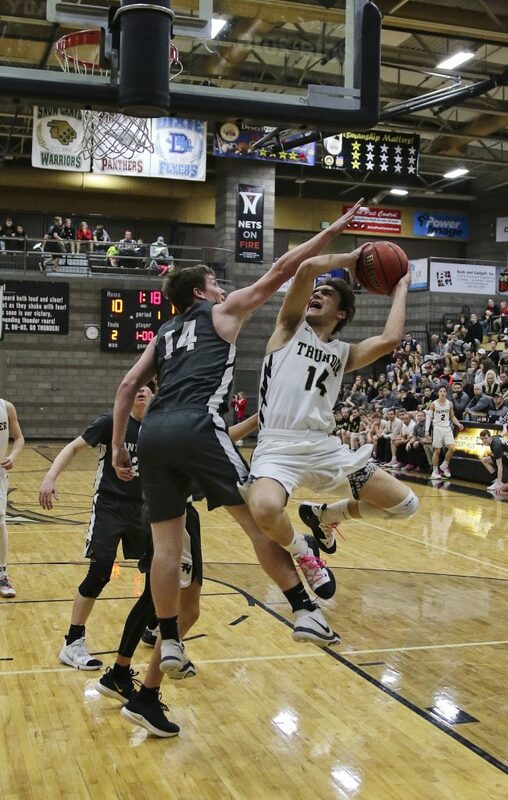 The Pine View Panthers broke away in the fourth quarter at Desert Hills to defeat Thunder. The Panthers stormed out of the gates, taking an early 13-2 lead before ending the quarter up by 10 points. 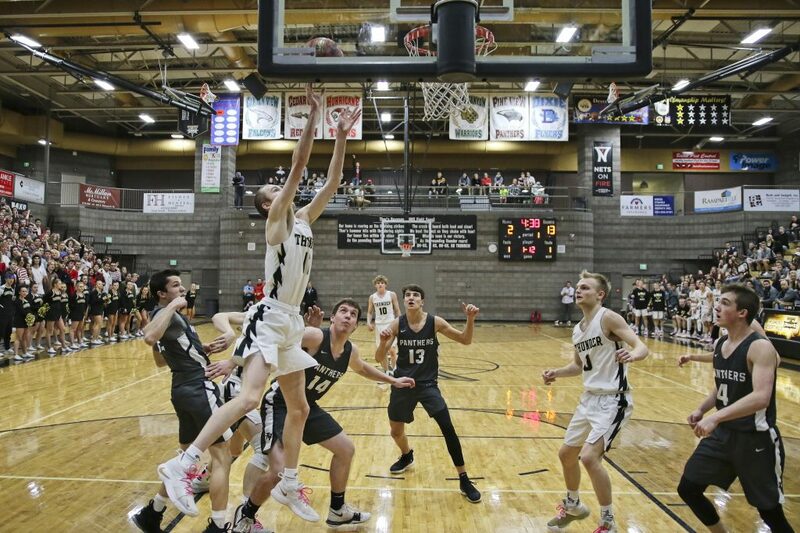 The game was much of the same in the second quarter, with Pine View taking a 33-24 lead into the halftime break. 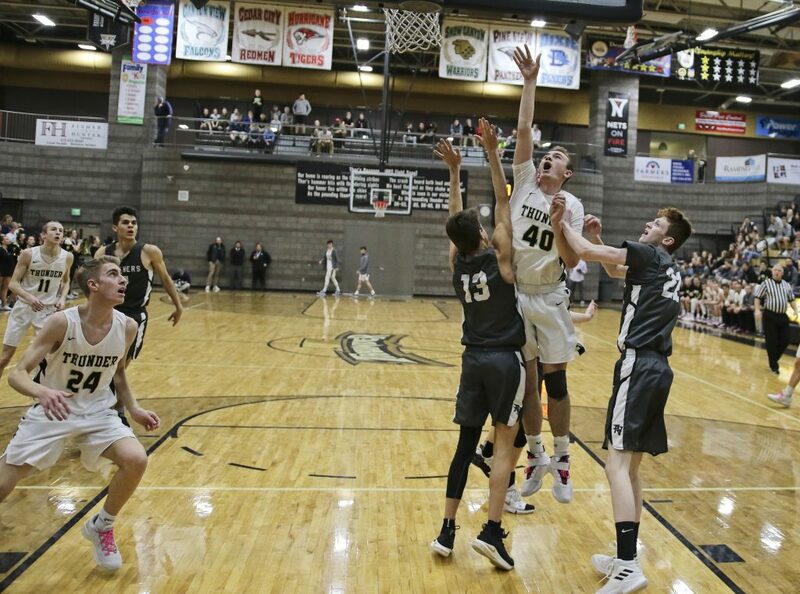 Desert Hills fought back in the third quarter with the backing of the home crowd, cutting the lead to three entering the fourth. After the lead was cut to just two in the opening moments of the fourth quarter, the Panthers went on a run, restoring their lead to 10 points, 59-49. 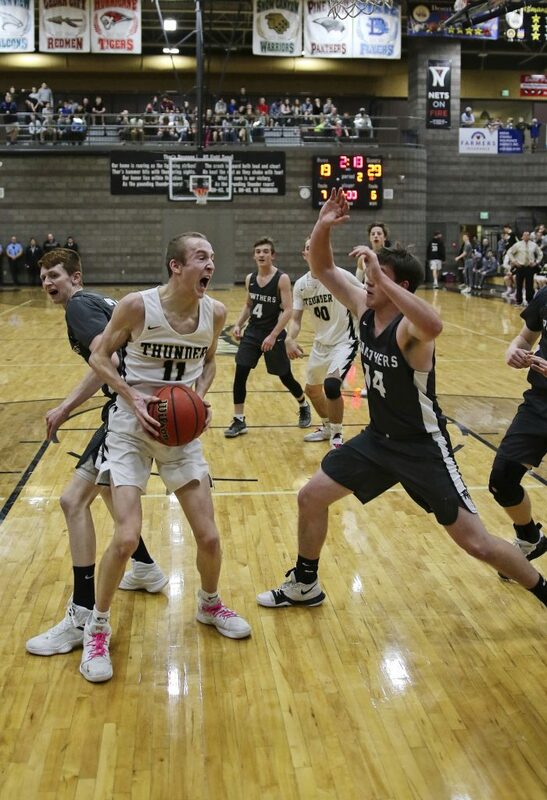 With the game nearly put away, Pine View headed to the line for much of the final minutes, hitting 8 free throws to seal the victory. 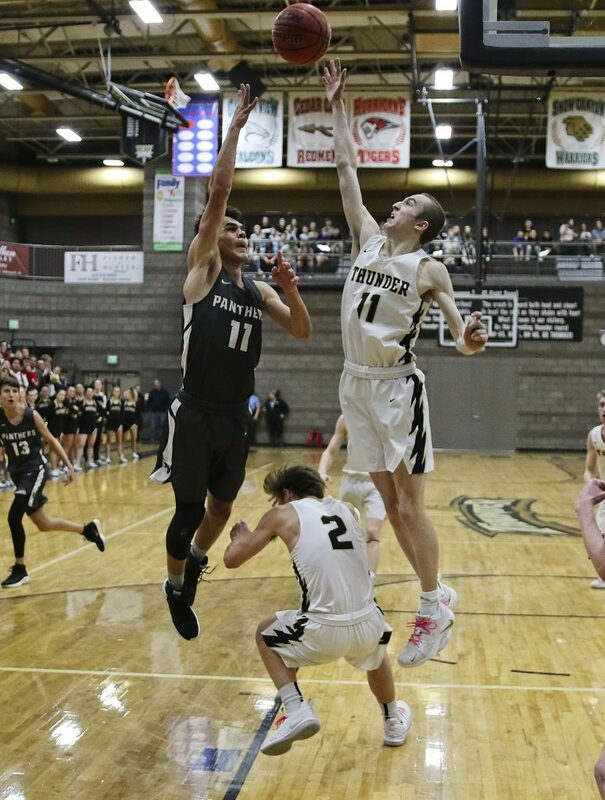 Jared Koller was the star in the win for Pine View, dropping 24 points on 8-of-9 shooting. Dallin Brown added 11 points for Pine View, while Jared Sudweeks chipped in 10. The Panthers improved to 6-0 in Region 9 play. “You know, we’ll make adjustments, watch film from the last time we played the different teams and we know teams will make adjustments against us’” Eves said of the plans for the second half of Region 9 play. The Thunder drop to 3-3 in region play. Keegan Munson and Mason Chase each scored 11 points in the loss, while Carson Thornton added 10. 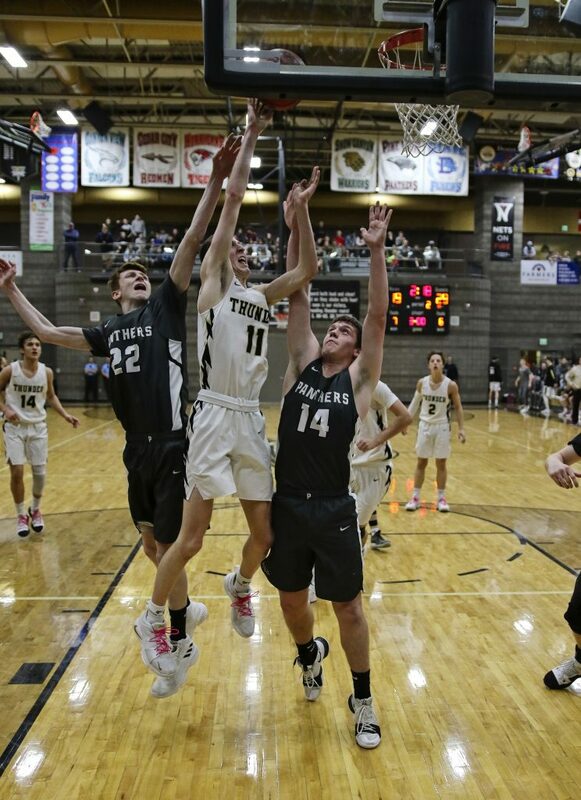 Desert Hills travel to Hurricane to play the Tigers at 7 p.m. on Friday. 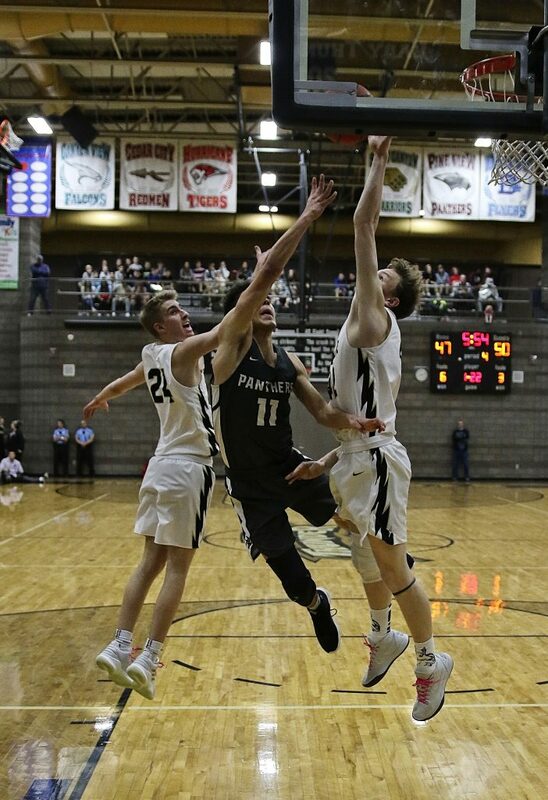 Pine View will look to stay undefeated and alone atop the standings when they host Snow Canyon next Wednesday. Tipoff is slated for 7 p.m. In a close game at Canyon View, the Flyers managed to hang on for a two-point win over the Falcons, 54-52. Trailing by two in the final seconds, Canyon View managed to draw an offensive foul on Dixie with less than one second remaining. 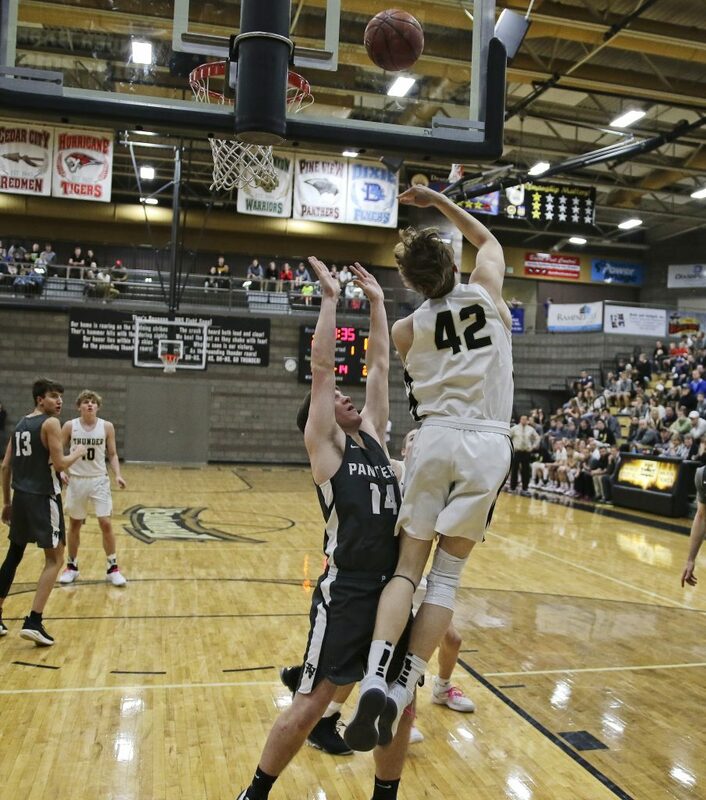 With just 0.7 seconds on the clock, the Falcons’ Mason Lyman managed to catch the inbounds pass at the top of the key and get off a potential game-tying shot, but it missed. “What we were really looking to looking for was for Mason to come down the lane, but they put their 6-7 kid in the block, in that spot. So (Lyman) read it and went high,” Potter said. “He was open, caught it and got a shot off. You know, that’s really all you can ask for at that point. Canyon View led 17-15 at the end of the first quarter, but the Flyers outscored the Falcons 14-7 during the second period to take a 29-24 halftime lead. Canyon View managed to stay within about four or five points for much of the second half before closing the gap to two at the end. Potter said it seemed like every time the Falcons would get within striking distance, the Flyers would hit a timely 3-pointer to extend their lead. Dixie’s Tevan Shaffer, a 6-foot-3 senior, made three big 3-pointers at crucial points during the game. Hayden Cottle scored 15 points to lead Dixie in scoring, while Jordan Mathews added 10 and Shaffer made 9. 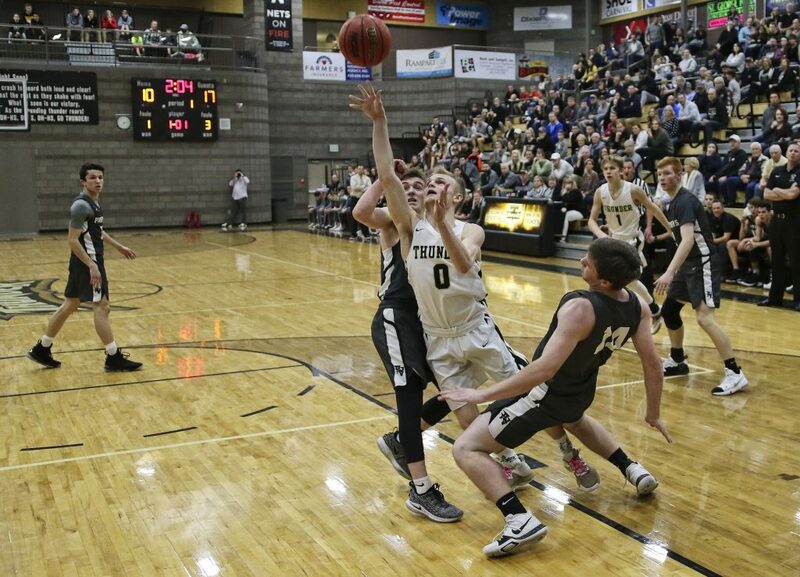 The Flyers were 6-for-8 on free throw attempts, while Canyon View made 13-of-17 free throws. Canyon View was led by Parker Holmes’ 19 points. Trevor Farrow added 15 points on five 3-pointers. Lyman finished with 8 points, and Junior Garcia and Kyle Sorensen each scored 5. The Falcons had just five different players score during the game, while Dixie had six players score. Dixie, which improved to 5-1 in Region 9 play, is now in second place in the standings at the halfway point of the season. 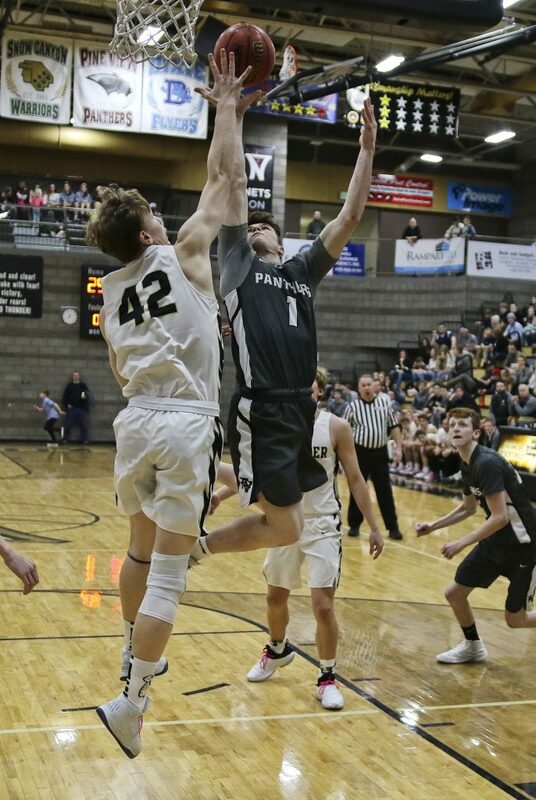 The Flyers host Cedar on Friday at 7 p.m.
Canyon View, which dropped to 3-3 in region play, is now tied with Desert Hills and Hurricane for third place in the standings. The Falcons travel to Snow Canyon to face the Warriors on Friday at 7 p.m. In a high-scoring affair, the Hurricane Tigers defeated the Cedar Redmen, improving to 3-3 in Region 9 play. 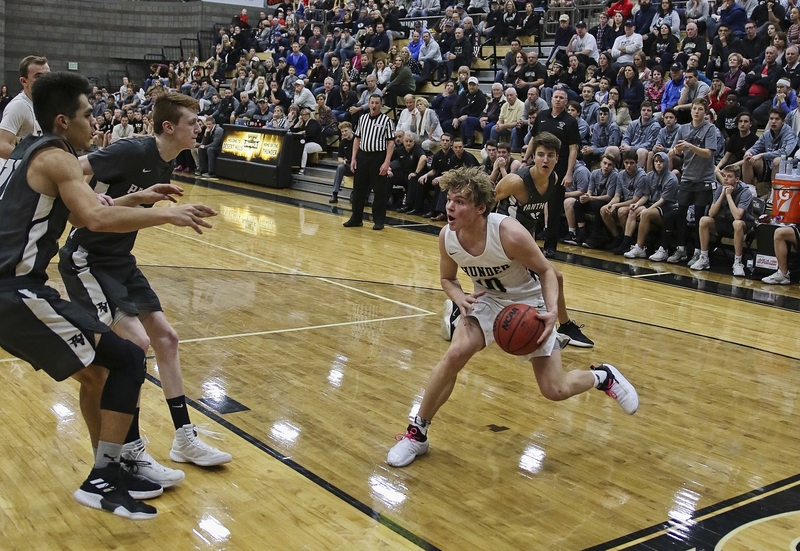 Cedar was on top early, leading by five after one quarter, but the Tigers marched back in the second and took a one-point lead into the half. The third quarter was where Hurricane created a larger lead, outscoring Cedar 29-20 to take a 10-point lead into the final frame. The teams traded buckets in the fourth, but Cedar wasn’t able to stop the Tigers high-scoring offense, giving Hurricane the win. The Tigers were led by five double-figure scorers in the win. Daxton Dayley led the way with 18 points, with Dallin Davis adding 16. Bryce Thomas and Domenic Scott each chipped in 15 points. The Tigers host Desert Hills on Friday at 7 p.m. The Redmen will travel to Dixie to play the Flyers on Friday at 7 p.m.